Historical Section of the General Staff, Canadian Military Headquarters in Great Britain, From Pachino to Ortona: The Canadian Campaign in Sicily and Italy, 1943 (Ottawa: King's Printer, ). The Moro River, with Villa Rogatti in the Background, Italy, 1943. On 6 December the Princess Patricia Light Infantry attacked the enemy on the Moro near Villa Rogatti. This operation was part of a larger plan to open up the way for advances in the west to Rome and in the east to Pescara, along the Adriatic coast. On 28 October, the 5th Division troops took over, and the LER moved back to Baranello near Campobasso for a month of rest and recovery. At the end of November, the 2nd New Zealand, the 8th Indian, and 78th British Divisions broke through the Bernhard Line along the valley of the Sangro River. Montgomery had promised to give the Germans a 'colossal crack' and expected that it would open the way to Pescara and Rome, but Kesselring quickly sent in the 90th Panzer Grenadier Division to bolster the line. 1st Canadian Division was to follow up the Sangro crossing and attack along the coast road. On 30 November, the LER left Campobasso for the coast and, by 3 December, were in position just south of the Moro River. On 6 December, the Patricias attacked across the Moro at Villa Rogatti and the Seaforths downstream at San Leonardo, while the Edmontons waited in reserve. The Seaforths were driven back and it took several more days of severe fighting by 1st Brigade with heavy armour, artillery, and air support to drive the Germans out of San Leonardo and consolidate the Canadian hold on the town. On 10 December, the LER moved out of San Leonardo, supported by a squadron of Calgary Tanks, and with orders to get control of the Ortona-Orsogna road and an important crossroads, codenamed CIDER, about three kilometers from Ortona. The divisional commander, Major-General Chris Vokes, expected the Germans to pull out of Ortona after their heavy losses at San Leonardo. No one on the Canadian side seems to have taken account of a ravine, subsequently known as 'The Gully',(14) that lay across the axis of advance. The Germans, recognizing that it was a perfect defensive position, impassable for tanks and too narrow to be reached by artillery fire, were dug in along its steep banks. The result was that the LER advance, after starting quickly, ran into unexpected and fierce opposition as soon as it approached the ravine. At 1000, an hour after the attack began, Colonel Jefferson signalled brigade that the intermediate objective, codenamed PUNCH, had been reached and that the troops were "now proceeding to final objective." At 1310 a signal reached battalion tactical headquarters that three companies were established on CIDER crossroads. In fact, they were nowhere near the objective. Later investigation failed to establish who sent the signal. The misinformation led brigade to cancel the planned air strikes, lift the artillery barrage, and launch the Patricias in an attack on the unbroken line of the ravine. Both attacks were thrown back with heavy losses. The LER was able to contain a German counter-attack supported by self-propelled guns, although three of their supporting Shermans were destroyed in the process. During the fighting, a group of Germans surrendered, but, when soldiers from the regiment came forward to take them to the rear, they dropped down and other German soldiers opened fire, wounding many men. For the next several days repeated attacks by the regiment and the rest of the brigade failed to budge the German lines. 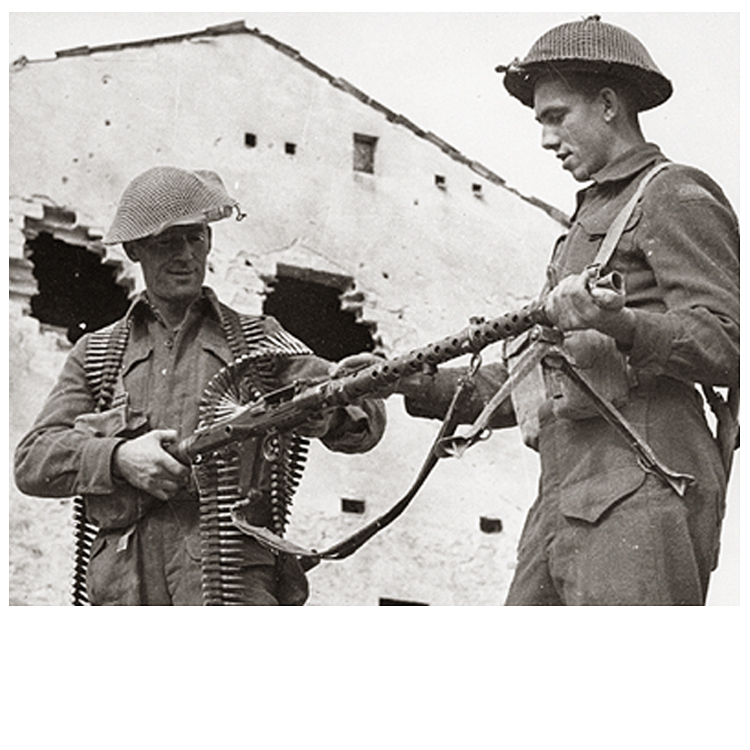 Soldiers examine a Machine Gun, Ortona, Italy, December 1943.
by Dr. Charles Fraser Comfort. infantry members of the Loyal Edmonton Regiment and the Seaforth Highlanders. Personnel of 'B' Company Advancing, Ortona, Italy, 21 December 1943.
thought that the advance would be swift, then they were mistaken. Ortona, Italy, 21 December 1943. Ortona, Italy, 30 December 1943. Boyd ultimately survived the blast; his comrades were not so fortunate. Indeed, Boyd was the sole surviving member of his platoon. City of Edmonton Archives (Loyal Edmonton Regiment Collection, A96-215, Box 53). National Archives of Canada (PA-114490, photo by Terry F. Rowe). National Archives of Canada (PA-116852, photo by Terry F. Rowe). National Archives of Canada (PA-130058, photo by Terry F. Rowe). National Archives of Canada (PA-115154, photo by Terry F. Rowe). Battle for Ortona, 20-27 December 1943. 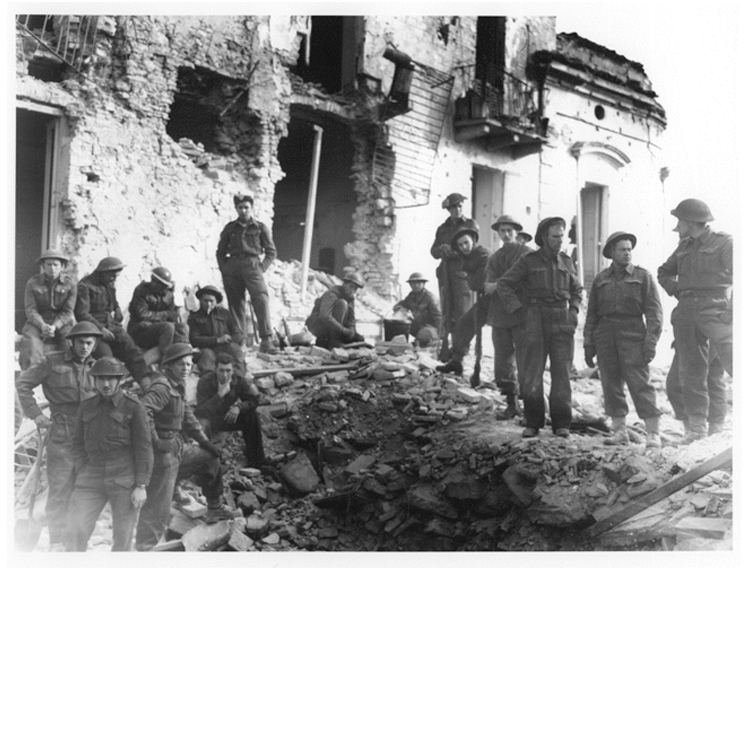 Sometimes referred to as a miniature Stalingrad because of the intensity of the house-to-house fighting, Ortona was a battle in which the Loyal Edmonton Regiment figured prominently. Aided by the Seaforth Highlanders, the Regiment managed to defeat highly trained German forces, who withdrew from the seaport on 27 December 1943. Major Paul Triquet, Victoria Cross Winner, ca. 1943. Major Paul Triquet won the Victoria Cross for his extraordinary efforts during the battle at Casa Berardi in December, 1943. Almost as soon as the two companies began their advance into the town, however, it became clear that the Germans had different plans. 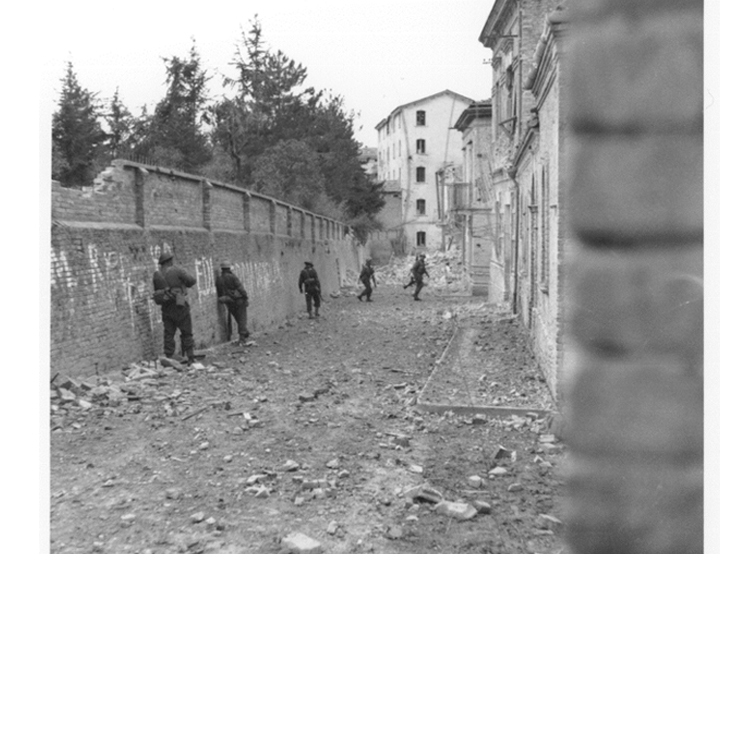 The paratroopers not only had remained in Ortona in force but also had blocked all the streets running towards the centre of town with demolished buildings and mines. Using the side streets to outflank the Germans was impossible. All that remained was to push straight ahead on the wider main street. 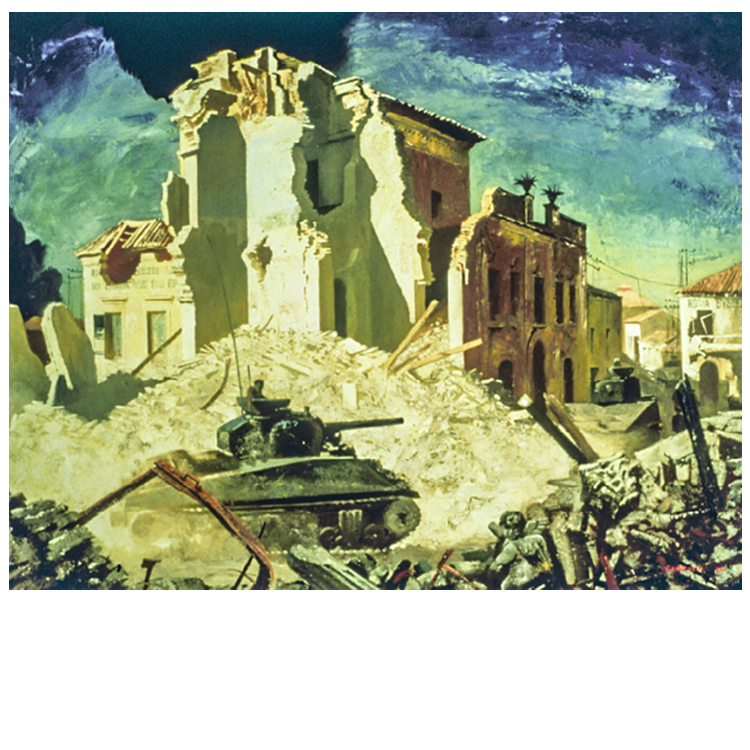 Ortona quickly became a house to house battle, unlike anything that had happened to the allies so far in the war. In fact the only comparable fighting, although on a much larger scale, was the deadly German-Russian struggle at Stalingrad. 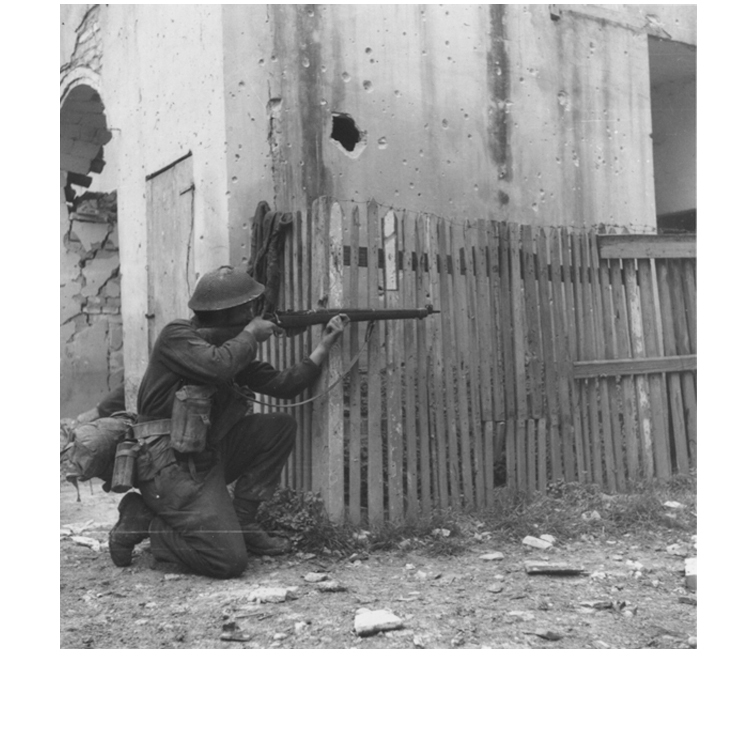 (16) Infantry had to control houses on both sides of the street to protect the tanks from anti-tank guns and the new panzerfausts (the equivalent of the British PIAT and the American Bazooka) used for the first time at Ortona; engineers had to clear mines to allow the tanks to move up; and the tanks had to be available to use their main guns to shoot snipers and machine-gunners out of upper story positions. Even with all the elements coordinated perfectly, it was a highly dangerous business. Pile of Rubble and Debris, Ortona, Italy, ca. December 1943. 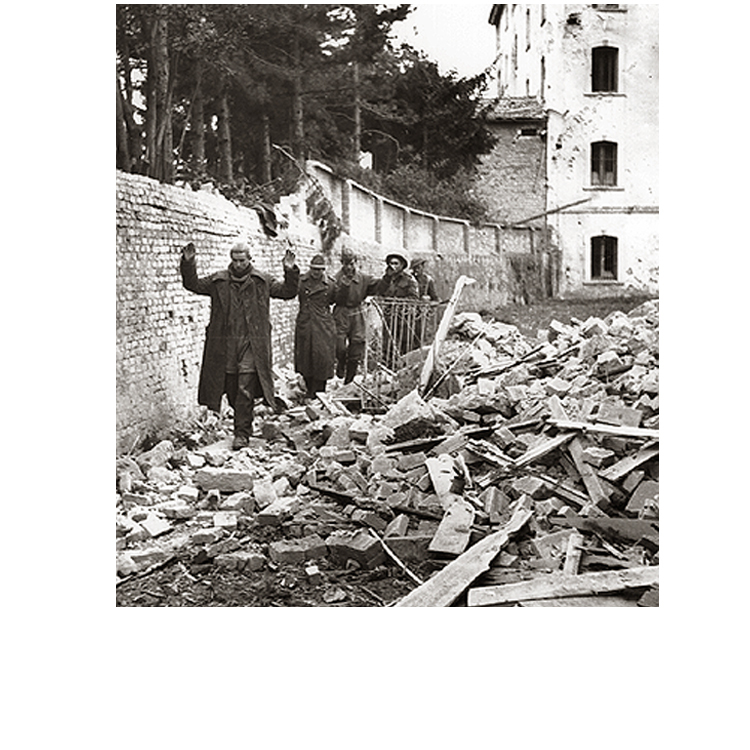 Mines, booby-traps, mouse-holing, and shelling reduced many of Ortona's main districts to rubble. German defenders often used the resulting piles of rubble for defensive purposes. Capturing the houses on both sides of the Corso Vittorio Emmanuele had to be done house by house, indeed floor by floor. Both sides used a technique called 'mouseholing,' using mines or explosive charges to blow a hole in the wall of an adjoining building and then clearing it without having to go out into the fire-swept street. Vacant houses had their own perils because they were usually heavily booby-trapped. By 23 December, the LER had fought its way to the main square in the centre of town, the Piazza Municipale, but at a heavy cost. The battalion had not received any replacements for the losses suffered at the Gully, and now was down to three companies with an effective strength of sixty men each. The build-up in England for the invasion of France in the spring had begun, however, and the armies in Italy were already feeling its effect. On Christmas Eve, a draft of replacements, mostly from Cape Breton, arrived. On the 26th, another hundred men came up, allowing C Company, whose few remaining soldiers had been sent to other companies, to be reconstituted. On Christmas Day, the Seaforths, fighting on the left flank of the LER, managed a pause for dinner in a damaged cathedral, but the Edmontonians had to 'dine' in their positions. On the 26 and 27 December, the enemy were pushed slowly out of the few remaining blocks of the town. On the 27th, just as the PPCLI was moving in to provide some relief, the Germans finally pulled out, leaving Ortona at last in Canadian hands. None too soon. Jim Stone's D Company now had just eighteen men still on their feet. The Seaforths had fought alongside the LER throughout the battle, as had the tanks and the engineers, but Ortona was unquestionably a Loyal Edmonton Regiment engagement. The LER carried the fighting through the centre of the German position. They took the heaviest casualties of the units involved (63 dead and 109 wounded). The name Ortona will be remembered as long as there are military units based in Edmonton. 14. The outlet of The Gully with the steepness of its sides unmistakably indicated by grape terraces and a switchback road can be clearly seen in an aerial reconnaissance photo taken before the battle and reproduced in Nicholson, Canadians in Italy, 305. 15. Mark Zuehlke, Ortona: Canada's Epic World War II Battle (Toronto: Stoddart Publishing, 1999), 252. The account is based on interviews with Col. Stone conducted in 1980 and housed at the University of Victoria. 16. John A. English and Bruce I. Gudmundsson, On Infantry (Wesport, Connnecticut, Praeger, 1994), 111.